Fun with monsters in Resident Evil: Degeneration. The wildly-successful Resident Evil franchise gets a CG film spinoff with Resident Evil: Degeneration, a mildly enjoyable, if otherwise inessential supplement to the overall series mythology. For diehard fans only. Review by Calvin McMillin: The Sony PlayStation video game Resident Evil has spawned numerous sequels, prequels, spinoffs, and side stories, even becoming a relatively successful live-action film trilogy, starting with 2002’s Resident Evil and continuing with 2004’s Resident Evil: Apocalypse and 2007’s Resident Evil: Extinction. Following in the footsteps of Square Enix - home of the popular video game franchise, Final Fantasy - the folks over at Capcom have similarly decided to unleash a full CG movie that continues the storyline of the video games, differentiating it from the live action series, which freely borrowed from the mythology, although never faithfully adhering to it. Picking up a full year after the events of the multi-platform hit video game Resident Evil 4, the film brings back that game’s protagonist Leon Kennedy (voiced by Paul Mercier), pairing him with his Resident Evil 2 partner and Code Veronica alumnus Claire Redfield (voiced by Alyson Court). For RE fans, this titanic coupling will actually mean something. For the rest of you, however, it won’t mean much. Story-wise, we are introduced to Claire first, as we soon discover that she’s joined up with Terra-Save, an activist organization formed in the wake of the infamous zombie outbreak in Raccoon City. Arriving at the airport, Claire meets up with a friend, only to find the reunion cut short by a viral outbreak. It seems the T-Virus (a viral strain that reanimates the dead and zombifies the living) has erupted onboard an arriving plane, which then proceeds to crash in the main terminal. Forced to take care of her friend’s young niece Rani (Michelle Ruff), Claire, along with controversial Senator Ron Davis, must take refuge in a nearby airport lounge, while everyone else either safely evacuates the building or tragically succumbs to the T-Virus. Meanwhile, two military-types named Angela Miller (Laura Bailey) and Greg Glenn (Steven Blum) are dispatched to save the remaining survivors. Leading them into the fray is none other than Leon S. Kennedy, on the recommendation of the U.S. president himself. Angela and Greg don’t know jack about zombies, a convenient fact which allows Leon to wax poetic on zombie-killin’ and reference events in previous entries in the series as a fan service. Not beholden to the airport location, the film eventually switches settings to a sleek research facility headed by the WilPharma Corporation, a shadowy group that was supposedly creating a T-Virus vaccine. Things take a turn for the worse when Angela’s brother, bio-terrorist Curtis Miller (Roger Craig Smith) infiltrates WilPharma. Curtis has a bone to pick with the U.S. government for its handing of the Raccoon City incident (the government had ties to the virus and nuked the town in response to the zombie outbreak) and wants revenge for a personal loss. Needless to say, stuff gets blown up real good at WilPharma. But that’s not the half of it. In the process, Curtis gets his hands on the G-Virus, which turns him into a cross between the H.P. Lovecraft’s Cthulhu and the Incredible Hulk on acid. Clearly, the odds are stacked against Leon and Claire. But then again, they’ve beaten this game before, haven’t they? Unlike another video game-turned-CG spectacle Final Fantasy VII: Advent Children, Resident Evil: Degeneration never really makes the transition. Granted, FFVII:AC was a bit confusing for the uninitiated, but it was engaging and even breathtaking to watch. RE: Degeneration, however, plays out more like an extended cut scene, one in which the viewer may find himself wondering, “When is the game going to start?” The CG works best when there is a lot of on-screen action, plenty of movement, and minimal dialogue. 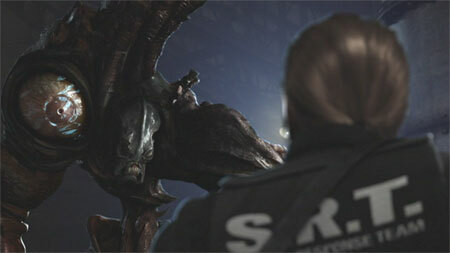 Graphically, the movie pales in comparison to the upcoming PS3/Xbox 360 game Resident Evil 5. The characters in RE: Degeneration look so stiff and lifeless at time, despite otherwise impressive CG work. Even worse, despite the fact that the characters' mouth movements clearly follow the English dialogue, the dialogue rarely syncs up. This jarring, puppet-like animation cheapens the film, as you’re paying more attention to the flaws than the narrative itself. Notes:  The film’s ending theme, “GUILTY,” is performed by Anna Tsuchiya.